To say events at the Drive4COPD 300 race in Daytona Beach on Saturday were a nightmare would be an understatement. Nearly 30 fans sustained injuries after parts of driver Kyle Larson’s car tore through the stands in the wake of a final-lap crash involving multiple cars. A video of the wreck, shot by a fan and uploaded almost immediately to YouTube, detailed some of the carnage that swept across the stands and the race-goers that filled them. In a particularly intense moment, one person appeared to be pinned down by an errant wheel that flew off one of the wrecked cars. But just as quickly as it was uploaded, the video was taken down from YouTube at Nascar’s request, citing copyright concerns. Odd, that, considering a quick YouTube search for Daytona Crash 2013 returns a host of videos from the event, yet to be pulled. So what gives? Is Nascar lagging on taking down all the copyrighted content showing up, or is Nascar selectively censoring the more gruesome footage showing up on YouTube? It seems the latter is the case, though Nascar positions it in a more noble light. Nascar wouldn’t respond to my further questions of whether the organization would pull other fan videos, referring me to the company’s original statement. So it looks as if we can view this in a couple ways: Either Nascar is indeed concerned with the well-being of the injured, or Nascar is trying to avoid a major PR headache by stifling the viral video of the brutal injuries its fans suffered. Call me a cynic, but I’m leaning toward the latter case. But whatever side you want to take, there’s another problem here: Nascar may not have the standing to request takedowns of these videos in the first place. Good question! We’ll see if that changes in the coming days, and if Nascar decides to change its tune. In the meantime, YouTube has not responded to a request for comment. Update 7:45 pm PT: Well would you look at that. Not more than a few hours later, the video in question has been unblocked, and is now viewable on YouTube user Tyler4DX’s page. 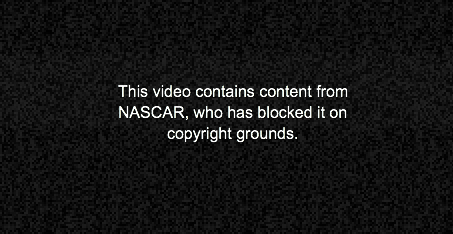 Looks like Professor Stewart was right, and YouTube deemed that Nascar’s copyright argument lacked sufficient standing. Still waiting to hear what Nascar has to say about that.